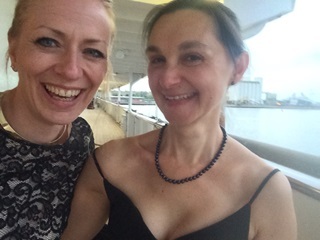 Had a wonderful evening playing on board The Royal Yacht Britannia last night as the regular harpist Iain Hood was playing harp somewhere else in Edinburgh. It was an honour to be part of a lovely couple’s golden wedding celebrations, and a very happy and nostalgic evening was had by all. 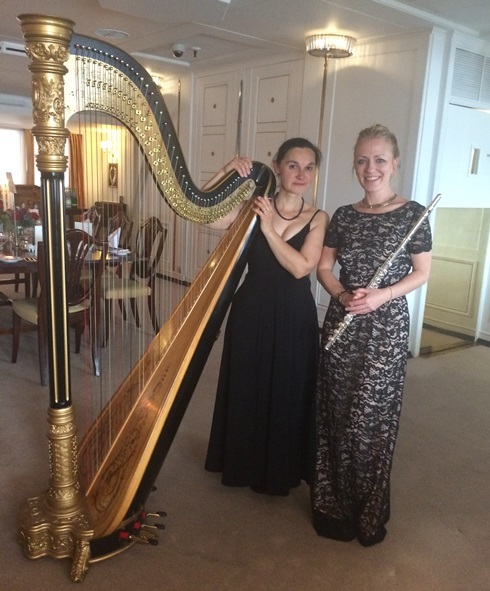 Using pedal harp (concert harp) with flute, we played a selection of classical and traditional / Scottish pieces, covering all of the requests made and more, including a request from the groom for The Dark Island. We are always happy to play as many requests as we can! 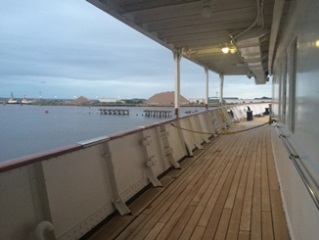 The Royal Yacht Britannia is a beautiful and very special venue. Now a tourist attraction it is well worth a visit, and in the evening it is a brilliant venue for corporate and private functions. For further information – we have examples of wedding packages on our website, although we like to tailor things for each couple, to help make their day exactly what they want. Our website also contains some short sound bites of the different styles of music we play. Please get in touch if you want to find out more or discuss your special day.